New Zealand is a country of big landscapes, big activities and, let’s be honest, big price tags. When travelling in New Zealand, we look for any ways to shave off the cents on the essentials so that we can spend more on once-in-a-lifetime experiences. Where you can make the biggest savings is on accommodation! What’s more, New Zealand has a tonne of options when it comes to budget accommodation, whether you’re travelling as a solo backpacker on a working holiday, a couple on a romantic getaway, or on a family road trip. We’ll go through them all in this guide on how to save money on accommodation when travelling New Zealand! On top of the solution to cheap travel accommodation in New Zealand, we’ll give you some fool-proof tips to help you save money. From the way you book your accommodation to the accommodation networks you join, all can have a serious impact on your travel budget. 10 quick-fire tips to save money on New Zealand Travel accommodation. They’re so simple that they don’t need a lengthy explanation. Check the facilities of your accommodation for extra savings – free shuttles, free breakfast, free bike hire, etc. Negotiate – ask for a deal. The worst that can happen is they say no. Check the “special deals” tab on hotel websites. BONUS: Check out our “DEALS” tab for the latest accommodation deals in New Zealand! 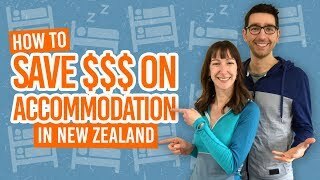 The first way to save money on accommodation when travelling in New Zealand is to be aware of all the kinds of cheap accommodation available. You could be missing on some huge savings if you didn’t, for example, know that holiday parks have cheap cabins for non-campers or that AirBnb is pretty huge here. When searching for cheap accommodation, consider these options. For more detailed descriptions on all these types of cheap accommodation, see 10 Types of Cheap Accommodation in New Zealand. The way you make your booking could save you some considerable amount of dollars. The most popular ways to book hostel, motel, hotel and holiday park accommodation in New Zealand is via travel agents, online booking engines like Booking.com, and direct with the accommodation. Each has their pros and cons, which we go through thoroughly in What are the Best Websites to Book Hostels in New Zealand? In short, consider searching for hostels/motels/hotels/holiday parks on booking engines to get a feel for what is available at your budget in your chosen destination. Then compare the booking website price with the price directly on your chosen accommodation’s website. The accommodation often have it listed for cheaper, or if you contact them saying you found the price cheaper elsewhere, they’re often more than happy to match the price. That way, the accommodation doesn’t have to pay commission and you don’t have to pay any booking engine fees. For those travellers that don’t want to rough it out in campsites or share a dorm with several other people, you’re going to want to find affordable private rooms. In theory, private rooms in hostels might seem like the cheapest option, as they are the cheapest type of budget accommodation. However, this is not always the case. You can often get higher quality private rooms at a cheaper price in motels, budget hotels and holiday parks. Not many people realise that! Private single rooms are just not that popular in New Zealand hostels. For private single rooms, you’re better off searching for motels and hotels. Motels are likely to have some sort of cooking facilities, to help save money on food, while you might want to consider hotels for something a bit more luxurious. Double rooms are a standard in New Zealand hostels and holiday parks. Both options have the benefit of access to fully-equipped kitchens and other essentials to help keep the costs down. However, for a similar or only marginally more expensive price, you can find higher quality double rooms and sometimes even self-contained rooms, i.e, they have en-suite and private kitchens, in motels, hotels and in many holiday parks. It’s a no-brainer that larger groups can find good private rooms for much cheaper in motels, holiday parks and hotels. Motels and holiday parks will often have family rooms with en-suite and private kitchen for the same price as family room in a hostel with no other private facilities. For more comparisons, see Staying in a Private Room: Hostel, Motel or Hotel? See a comparison in our BBH, YHA, BASE or NOMADS: What is the Best Hostel Network? Accor Hotels (IBIS) – Rewards scheme to “treat yourself” or credit points after check-out. Should you join an accommodation network? Because there is often a fee to join a membership program with accommodation networks, you need to make sure you’re going to use the accommodations often enough to get your money back. If your chosen network has accommodation in most of the destinations you want to visit, then you’re likely onto a big saving. If you’re travelling New Zealand on a work visa, like a working holiday visa, then you can take part in work for accommodation opportunities commonly known as WWOOFing. WWOOFing is simple: work 2-4 hours a day five days a week in exchange for free accommodation and food. Agreements can last from anywhere between three days to three months. While traditionally, WWOOFing was all about working on farms – the name comes from the World Wide Opportunities on Organic Farms organisation – today WWOOFing can be done in all types of work. Childcare, cleaning, gardening, animal care, computers, building, eco projects, art projects, cooking, and more! Find out more at How to Find Work for Accommodation in New Zealand. Travelling New Zealand by campervan is not only super convenient – your accommodation is your transport, it’s also a great way to keep the costs to a minimum on accommodation. However, because of New Zealand freedom camping laws, you will have to pay for campsite and holiday park accommodation very frequently unless you have a certified self-contained campervan. This means that your vehicle has a certification to show that your vehicle can hold waste water, fresh water, has a toilet and a bin. Only self-contained vehicles can camp for free on public land. If you vehicle is not self-contained, then you will have to pay for campsite and holiday park accommodation almost every night on top of your rental costs. In the end, you will not have saved as much money as you probably would have hoped. For more information of what exactly is a self-contained campervan, see Self-Contained Campervans in New Zealand. For more information on freedom camping, see What it’s Really Like to Freedom Camp in New Zealand. And read more about camping in Camping in New Zealand.